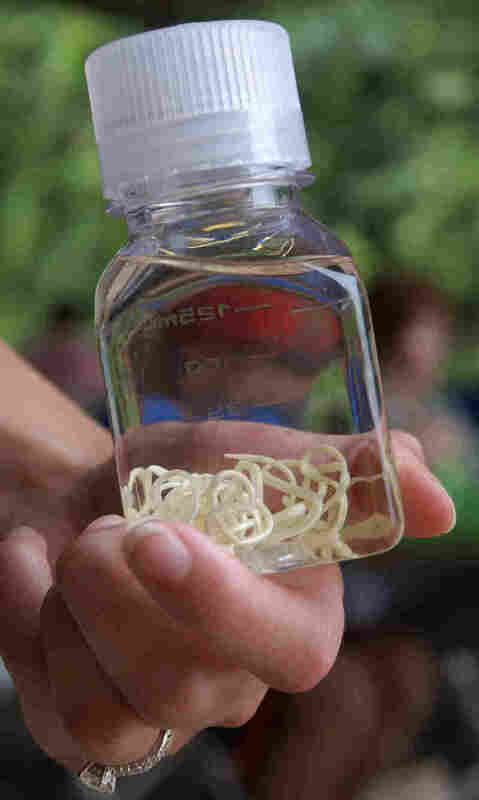 Slaying 'Little Dragons': Guinea Worm Moves Toward Eradication : Shots - Health News Known as the "affliction with little dragons," Guinea worm is a nasty parasite that can grow up to 3 feet inside a person. A decades-long campaign to eliminate the worm is starting to pay off. There were only about 500 cases worldwide in 2012, and 89 cases in the first half of 2013. 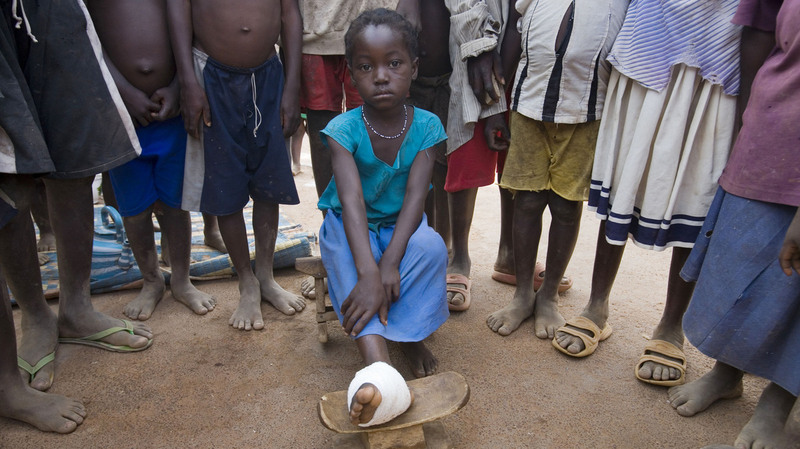 Hawah Alhassan, 5, contracted Guinea worm in a village near Tamale, Ghana, in 2007. The country eliminated the parasite in 2011. The world has eradicated just one human disease: smallpox. But another illness is getting tantalizingly close to elimination. No, we're not talking about polio; that virus also has its back against a wall. But a report Thursday puts a parasitic worm ahead of polio in the race to extinction. The Guinea worm can grow up to 3 feet inside a person's body. The world recorded just 89 cases of Guinea worm in the first six months of 2013, the Centers for Disease Control and Prevention said in the journal Morbidity and Mortality Weekly Report. That's a 77 percent reduction in cases over the same period last year. In contrast, more than 300 polio cases have occurred so far in 2013, compared with just 223 reported in all of 2012. Guinea worm gets little attention in the media, perhaps because of its stomach-churning life cycle. The parasite grows up to 3 feet inside a person's tissues and then emerges from a painful wound in the skin. The worm isn't deadly, but it cripples a person for several weeks while the worm emerges. The disease is also known as dracunculiasis, or "affliction with little dragons," because the worm feels like hot coals as it exits from the skin. Back in 1986, more than 3.5 million people got infected with Guinea worm each year. A campaign led by The Carter Center has slashed the number of cases in the past decade. There were only about 1,000 cases recorded worldwide in 2011, and 542 cases in 2012. If 2013 follows the trend, then the prevalence of the disease will reach an all-time low. The worm is now endemic in just four countries: Chad, Ethiopia, Mali and South Sudan. The vast majority of cases occur in South Sudan, and that country has made the most progress in eradicating the Guinea worm in the past several years. South Sudan has reported an 80 percent reduction in cases so far in 2013 compared with 2012, despite a slew of challenges for health workers. A key bridge collapsed on the only road to a part of the country, slowing transportation of vital supplies. Cattle raiding caused populations to move around unpredictably, the CDC's Dr. Sharon Roy and her colleagues wrote in the report. The biggest challenges, however, to eradicating the parasite are probably in Mali. The country has reported just one case of Guinea worm in 2013. But violence after a coup d'etat has kept health workers out of some parts of Mail since April 2012, Roy and her colleagues write. People get infected with dracunculiasis through contaminated drinking water. So teaching people to filter water and installing wells have been two key methods to reduce new infections. If local health workers can't reach people because of violence, then just one infection could quickly spread through drinking water and multiply into 50 to 100 cases.